Trump University LLC (aka the Trump Wealth Institute and Trump Entrepreneur Initiative LLC) functioned from 2005-2010; it was not a university but a program promising participants a way to riches through real estate, entrepreneurship, and wealth management. Only someone completely ignorant of what a university is would have enrolled in Trump University while thinking they were enrolling in a real university. The Oxford English Dictionary defines a university as "an educational institution designed for instruction, examination, or both, of students in many branches of advanced learning, conferring degrees in various faculties, and often embodying colleges and similar institutions." 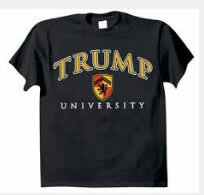 Trump University offered classes in real estate, asset management, entrepreneurship, and wealth creation. * Trump University was a for-profit education business; it offered no degrees, no college credits, and was not accredited. In short, the name 'Trump University' is deceptive and misleading, much like the program it offered. Trump University originated with Donald Trump, Michael Sexton, and Jonathan Spitalny. Trump University was incorporated in 2004 with Donald Trump owning 93% of the company. * Trump advertised that he could "turn anyone into a successful real estate investor, including you. "* Introductory classes were held in rented spaces such as hotel ballrooms and were offered for free. New York attorney general Eric Schneiderman claimed that these free classes were ruses and "the first step in a bait and switch to induce prospective students to enroll in increasingly expensive seminars starting with the three-day $1,495 seminar and ultimately [for] advanced seminars such as the ‘Gold Elite’ program costing $35,000.”* Even so, if the seminars, regardless of cost, delivered what was promised, the deception of those behind Trump University might be forgiven. Some might quibble, however, that since 'successful real estate investor' is too vague to be of any legal significance, the program's main promise had no real meaning. What is the evidence that Trump University delivered on its claim to turn anyone into a successful real estate investor? As far as I can tell, there isn't any. Such evidence would consist of establishing a baseline of wealth for each student, a clear definition of 'successful real estate investor,' and a follow-up on the success each student had as a real estate investor. No evidence has been presented by the Trump University people that any baseline or progress was kept on any student. The only evidence presented in support of Trump University has been trumpeted many times by Donald Trump himself: students gave a 98% approval rating to their Trump University experience. Approval ratings, however, are irrelevant to assessing the claim that students became successful real estate investors thanks to Trump University courses because requests for such ratings occur soon after courses are completed rather than several years later, after the principles and lessons of the courses have been applied. You can't measure success or failure as a real estate investor by approval ratings given before the lessons of the courses can be put into practice. In any case, what seems to have spurred Mr. Trump into focusing on approval ratings was to offer what he considered an appropriate response to multiple lawsuits filed against Trump University. Though the approval ratings are irrelevant to evaluating the worth of Trump University courses, it is important to emphasize that they were given at a time and in such a way as to make them nearly worthless as an assessment tool of the courses' effect on the real estate investments of the participants. It is also worth noting that many of the approval assessments came from people who attended the free seminars. * Most of those who attended the free seminars did not go on to pay for courses at Trump University. It is estimated that 80,308 people attended one or more of 2,000 free, 90-minute preview sessions, while 7,611 of these went on to become paying customers. * The proof that Donald Trump should be providing is evidence that a significant percentage of the more than 7,000 paying customers went on the become successful real estate investors. Trump, however, has not even indicated that his people established baseline wealth of his students or did any follow-up to see how successful they became in real estate investment. ...shortchanged thousands of vulnerable consumers, a large portion of whom were elderly, targeted with messages that Trump University was their ticket to avoiding spending their final years working as greeters at their local Walmart. Trump will no doubt have an answer for each of his critics, no matter how irrelevant that answer might be.